A medium sized vessel of superior rating. Built in 1983 and refit in 2000. Carries a maximum of 1350 passengers in 626 cabins, 423 of which have ocean views. 4 cabins are accessible to disabled passengers. All cabins are well equipped and include air conditioning, TV and plenty of storage space. Suites feature kingsize beds, lounge, minibar and bath. The Broadway Show lounge features live shows and the High Spirits Nightclub also features a disco. Other features include 200 seat cinema and internet access. First of all were told that if we didn't pay £9.50 each each way on the Thomson flights it couldn't be guaranteed that we would sit together. Then on getting on board the ship were told that the cabin safe would cost £15 for the week. Never paid for a safe on any previous cruise. On asking before booking, if there was wi-Fi were told yes, in public areas and they couldn't see that there was a charge. They charged £15 for a day and £8 for an hour. Getting off at destinations little cafes were able to provide it free!? On the whole felt Thomson's were trying to squeeze as much money out of us as possible. £ for £ felt P & O gave better value. Would also say that the cabin and restaurant staff were unfailingly polite and helpful. Entertainment was good in the Horizon and High Spirits lounges. We choose this cruise for a family cruise with my children, 19 and 21 and my husbands dad of 80. Our first problem was on getting to the cabin we were sharing with my father in law it was only set for 2 people, 2 beds made and 2 towels. On reporting this we were told it would be done by 6PM. We returned at this time to find the cabin the same. My father in law would normally sleep in the day but even though we had been up since 2AM had been unable to due to the cabin not being made up. The pool by the restaurant was filthy and not usable on the first day and on walking into the restaurant to eat the first staff member was looking at there mobile phone. I reported all this to customer service and was made to feel uncomfortable, they said they would come back to me but never did. The cabin was made up, the pool was then kept clean and I did not see any other staff using there phone. The last problem was I only use soya milk but for the last 2 breakfast times I was just told they had run out. I again reported this and they said they would note it down. I never received any acknowledgement about my complaint and just told it was logged. After a month of returning I just received a letter saying sorry. I felt really let down and due to the customer service of not caring this was our worst cruise after MSC, p&o and Ocean village. The money paid for this cruise in no way reflected the condition or age of this ship which we where told by staff was being retired very soon myself and my wife where on this cruise for our anniversary and to be honest it ruined it for us the public toilets throughout the ship where overflowing human waste for most of the cruise the corridors on our deck where swamped with water they had dryers on all night to try and dry them out it was stinking I contacted Thomsons on our return they checked what I was complaining about I received an apology by email excepting the problems had been ongoing and offered me £80 in the form of a voucher to be used against my next Thomson cruise (no chance of that). I wrote back asking if my wife was to receive a voucher no was the answer so think hard about cruising on the spirit it's falling to pieces and customer service with Thomson cruises is a joke. We had a good hol on this ship BUT it vibrates and shudders like nothing on earth! Our cabin 537 on deck 3 was so noisy I was sure we were sleeping on the engine! It is a shame as everything else was so good, great entertainment, lovely food and lovely staff apart from one waitress who questioned me when I requested a soft drink instead of alcohol. She wasn't to know I have a heart problem therefore can't drink a lot but I don't expect to be challenged over it! Wouldn't recommend this ship to anyone because of vibration and noise. We had a good holiday on this ship BUT it vibrates and shudders like nothing on earth! Our cabin 537 on deck 3 was so noisy I was sure we were sleeping on the engine! It is a shame as everything else was so good, great entertainment, lovely food and lovely staff apart from one waitress who questioned me when I requested a soft drink instead of alcohol. She wasn't to know I have a heart problem therefore can't drink a lot but I don't expect to be challenged over it! Wouldn't recommend this ship to anyone because of vibration and noise. then cruise on this one star ship. The only good point of this ship is the excellent staff. The best part of the holiday was leaving the ship and coming home. For the money we paid we would have received much better value with another cruise line. Just got back from Spirit cruise and it was a fantastic holiday. The staff were great and couldn't do enough to make our holiday special. The restaurant was very helpful to me as I am gluten free they made my meals all gluten free. I kept the same waiters all week and they were great, thank you Wadi, Adie and Herbert for being so kind and the rest of the restaurant staff. Thanks to Valantina and Hussan for keeping our room clean and tidy and also for making my birthday extra special by trimming my room up. I will definitely be back. Went on cruise on 6 July 2015 for 1 week. Without a doubt the best holiday we have ever been on. From the minute we got off the plane in Turkey Thomson reps were there and the security to get on board was great. The food was second to none, the service fantastic, nothing was to much to bother for any of the staff, best ever. The entertainment was fantastic, always a choice of entertainment every night with top shows. The ship was very clean and the cabin was made up twice a day. We thought we might get sea sick, no, very smooth sailings. All in all fantastic holiday, top marks to the Thompson Spirit crew. We will definitely be on another Thompson cruise. 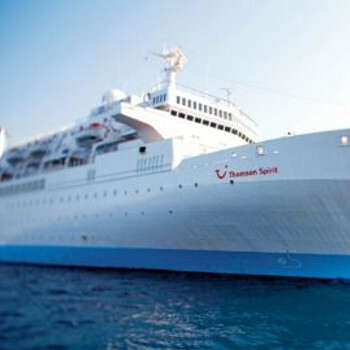 Just returned from Baltic Highlights cruise last Saturday on the Thomson Spirit. Excellent cruise, weather was great and food was excellent. Richard was a great cruise director, always pleasant and friendly and his show team and entertainment were great. All places we visited were within walking distance and if not Thomsons had a courtesy bus on from the docks. Our bar steward we met, Nenita, was a lovely girl always pleasant and friendly and was trying to learn Geordie from us. Only thing I found was there was no sugar free cakes out like the Celebration last year as I am diabetic. Overall had and excellent holiday.